Auto accidents can be a traumatic experience. But having your car repaired shouldn’t be. At McLeod's Body Shop, we understand how stressful auto collision repairs can be and we strive to make your auto repair experience as smooth as possible. If you have been in an auto collision and are looking for an auto body repair shop to restore your vehicle back to its original beauty, count on us to help. McLeod's Body Shop is a premier auto collision repair specialist in the Ashland Kentucky area, and we guarantee our work. We will make the process easy for you by working directly with your insurance company on your behalf to manage your claim. 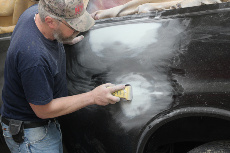 We have served motorists in Ashland Kentucky and surrounding areas of Ohio & West Virginia since 1981, and have more than 150 combined years of experience in quality auto body repair, paint work, and excellent customer service. We strive to be fast, working hard and efficiently to repair your car back to its pre-accident condition and get you back on the road as soon as possible. Our workmanship and parts are guaranteed for as long as you own your vehicle. Let McLeod's Body Shop help you through a time of stress and inconvenience. Call us today at 606-329-1616!